Fortunately Truman is quite tame from the breeder. He already steps up and allows touching. However, there are some additional taming exercises that I must do with him in order to prepare him for some tricks that I would like to teach him down the line. Furthermore these taming behaviors make maintenance easier as well. The two things I am working on are laying on his back in my hand and letting me pull his wings open. I have been using a combination of modeling, flooding, positive, and negative reinforcement to begin taming these behaviors. The modeling involves having Truman watch me hold Kili on her back and open her wings. Kili doesn't mind these at all and I don't have to give her treats but I do just so Truman can see he can get treats for it too. Flooding involves the fact that I just do it. I flip him on his back or open his wings whether he wants to or not. He just has to get used to it happening to him. The negative reinforcement is that I flip him back up or let go of his wing when he relaxes and stops resisting me. The positive reinforcement is that I give him a treat upon completion of each behavior. Here is a video of a taming session with Truman. The video is quite long but I recommend watching it through entirely because I demonstrate different things throughout the video and provide helpful tips as I go. This is a real training session in progress. There are no final results yet but even by the end of the taming session Truman is less resistant to the exercises. Taming your parrot to lay on its back is not only useful for teaching the play dead trick but also to be able to hold it to trim its nails and to be able to carry it from place to place. Taming the parrot to open its wings is not only useful for training the wings trick but also can be used to inspect wings for broken feathers, clipping, and putting on a harness. Remember that this can be a long gradual process that requires a lot of patience and practice. It can take anywhere from a few days to a few weeks or months before you see results. However, if you practice these taming behaviors a few times a day over a long period of time, the parrot will get used to this and allow you to do it even without treats. Once your taming is complete, be sure to practice these behaviors on occasion so that the tameness is not lost. Finally I'd like to mention that Kili and Truman are beginning to get along much better to the point that they were sitting together on a 12 inch perch and not even fighting. EXTREMELY HELPFUL! I had to ask the lady I got Sadie from to show me how to do this but being able to watch it right before I try over and over is very, very helpful. I have to be sure I grab her smoothly and confidently and that means knowing where to put my hand. Thanks for taking the time to show us this! In your case pay more attention to how I grab Kili than Truman since you have a Senegal. However, follow the pace and technique I use on Truman cause I go faster with Kili. Also you will find this helpful and it is Senegal specific: http://www.youtube.com/watch?v=OJpBPUtgpMY it is labeled for one person-birds but the same technique is used to tame a no-person bird! Thank you!! I was at the point where I was able to put my entire hand around her body, but lately she has learned that biting gets her somewhere (thanks, boyfriend), so I'm suffering a lot of wounds here and really gotta crack down and sort of train from the beginning again. She will bite me for no reason at all and then just look at me while she's doing it. I actually heard my skin pop from where she pinched it so hard... It's not pleasant, so if it's bad, I'll blow in her face, but then she comes back and bites harder. Ahh... Well I worked with her all day instead of going to the movies like I was going to and we've made lots of progress, so hopefully within a week I can begin trying to pick her up again. Thanks for the videos! Can this be done with an older bird (5 years), im making sure blue is used to touch all over his body first. just want to be sure im not too late, or is this a case of better late than never? My birds never really bit me cause I was working with them since they were very young. The only trouble I had with Kili was biting other people or Truman which I spent a lot of time resolving. The only time either has bitten me was not realizing me, in a panic, or while looking at the other bird. I didn't condition Truman to touch gradually. It was [url=http://trainedparrot.com/index.php?bid=20&article=Early+Taming+Steps+About+How+to+Tame+a+New+Parrot:35pjq5rf]just like in this article[/url:35pjq5rf]. One session to teach and then a few to solidify. Hi! i am new here. i am thinking of getting an Indian Ringneck. i am 15. i don't like loud noises or doing anything fast. i live in a medium sized household. no pets. i have at least 5 hours of free time a day. is this a good first pet for me? please help. 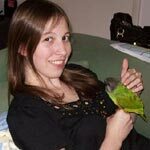 i don't want to get a bird when i am not suited for it and i have been doing a lot of research on how to take care and interact with a bird. please give me info on if i should get an indian ringneck if not, please tell me what birds may be good for me. thanks. To be honest, I'm not sure any kind of bird is a good pet for you if you don't like loud noises. Even my cockatiel is capable of letting out some earsplitting shrieks , and does sometimes and 'tiels are one of the quietest parrots. Also, please remember that parrots live a long time and at 15 you can't know what you'll be doing 3 or 5 years from now and whether a parrot will fit in to it. A bird is not an easy pet & is a big commitment, please think carefully about whether you can take that on at this stage of your life. [quote="janetafloat":1z7n9369]To be honest, I'm not sure any kind of bird is a good pet for you if you don't like loud noises. Even my cockatiel is capable of letting out some earsplitting shrieks , and does sometimes and 'tiels are one of the quietest parrots. Also, please remember that parrots live a long time and at 15 you can't know what you'll be doing 3 or 5 years from now and whether a parrot will fit in to it. A bird is not an easy pet & is a big commitment, please think carefully about whether you can take that on at this stage of your life. [/quote:1z7n9369] +1 Sorry but I would hold off for a few years until your out of education and preferable in a stable job. Also ringnecks seem to crop up frequently in posts crying for help because of noise/biting issues. Not trying to put you off but now probably isn't the right time for you or the bird. Slow down and listen to your bird. Take a little time to understand the natural nature of your bird. No matter how hard we try not a single one of us are able to act in a manner that is contrary to our nature for any length of time. Greys are very touchy about physical contact and the reason that it is not allowing you to lift its wing is because it does not yet trust you enough. Take your time as these birds live a very long time and you have plenty of time to gain your birds trust, so work slowly on this issue by teaching your bird to allow you to just touch its wings and then to begin to touch the inside of the wing and then to lift it just slightly and only for a second and then put it back down, give the bird a treat and try again later. repeat this as needed.